Beatriz is a single mother who has raised her two children by working arduous days where she is exposed to the risks that being a street vendor brings. 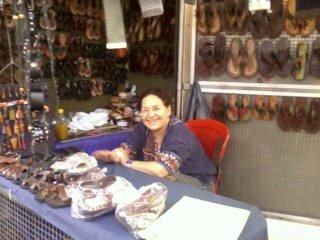 She has been an independent business person for 35 years, and has a stand selling crafts and other products, located on a street in the center of the city. She works on her own from Monday to Saturday from 12 to 9 p.m., as in the mornings she does her daily household chores. The advantage of her business is that she can manage her own time and plan her income, however she says she doesn't have Social Security and sees this as a disadvantage. The loan she is requesting will be used to buy merchandise at wholesale (crafts, leather sandals, belts, and other items). This will allow her to have a greater variety of articles available to sell, and this way satisfy the tastes and needs of her clientele, enabling her to improve her sales and the income she receives from them. Beatriz says that her aim is to give continuity and permanence to her business, to gradually build it up and formalize it so that it can be more profitable and allow her to improve the living conditions and well-being of her family. Congratulations to Beatriz in Columbia..!